Product prices and availability are accurate as of 2019-04-20 20:00:43 UTC and are subject to change. Any price and availability information displayed on http://www.amazon.com/ at the time of purchase will apply to the purchase of this product. 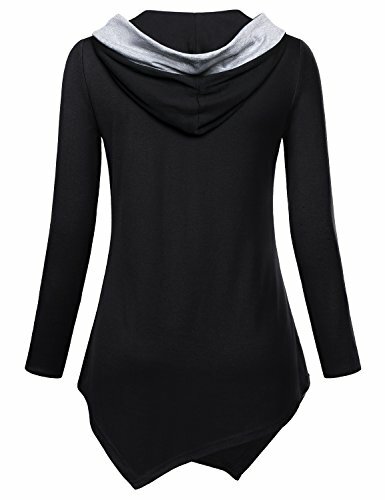 Miusey upgrades a cozy hooded sweatshirt finished with an asymmetrical hem and kangaroo pouch pocket. *Washed up nicely and have no issues with shrinkage or wrinkle. *Drapes perfectly and gives you a good shape without clingy, especially midsection. *The longer hemline provides coverage in the back, great to wear with your lovely leggings, skinny jeans for office or casual wear. 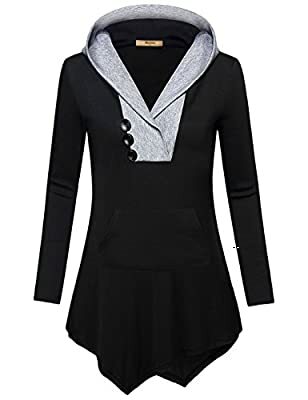 V-neckline with attached hood/ long sleeve / button trim/ kangaroo pouch pocket at front/ asymmetric hem/ relaxed fit The classic look and feel you love gets better with miusey's lightweight hoodie, featuring soft material that keeps you comfortable without the bulk. A chic fitted silhouette and bold contrast colorblocking create a standout-stylish statement on miusey's hooded sweatshirt, while the asymmetric hem makes the pieces flow gracefully. The handy kangaroo pocket gives you a look that's great for casual days, an essential hoodie for your closet.. Please refer to size chart under the Product Description before ordering, thank you!